Five people, two of them soldiers, have died in southern Yemen in clashes between security forces and protesters demanding secession, officials say. There have been other similar clashes in the south in recent months, fuelling concern about the country's stability. 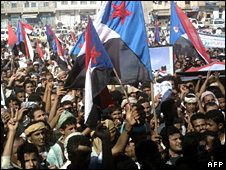 Wednesday's demonstration in Ataq, 500km (310 miles) south-east of the capital Sanaa, happened five days before the 42nd anniversary of the British withdrawal from Aden, which gave independence to South Yemen. "They surrounded us from every side and started shooting," he told the Associated Press news agency, adding that many protesters had later been arrested. People in the south, home to most of Yemen's oil facilities, have long complained the central government takes advantage of their resources but marginalises and discriminates against them.